First Sentence: Master was a little crazy; he had spent too many years reading books overseas, talked to himself in his office, did not always return greetings and had too much hair. Reason for Reading: I was drawn to this novel from the very first time I heard about it several months ago, and the more I heard about it, the more I was sure I wanted read it. And so it was with great anticipation that I opened the book to the first page and began to read. This is my third selection for the New York Times Notable Book Challenge and my eighth and final selection for the Spring Reading Thing. From the Publisher: With the effortless grace of a natural storyteller, Adichie weaves together the lives of five characters caught up in the extraordinary tumult of the decade. Fifteen-year-old Ugwu is houseboy to Odenigbo, a university professor who sends him to school, and in whose living room Ugwu hears voices full of revolutionary zeal. Odenigbo’s beautiful mistress, Olanna, a sociology teacher, is running away from her parents’ world of wealth and excess; Kainene, her urbane twin, is taking over their father’s business; and Kainene’s English lover, Richard, forms a bridge between their two worlds. As we follow these intertwined lives through a military coup, the Biafran secession and the subsequent war, Adichie brilliantly evokes the promise, and intimately, the devastating disappointments that marked this time and place. Comments: Between 1967 through to the beginning of 1970, Nigeria was in the midst of a civil war. A coup over the government by the Igpo people was short lived when another coup by the Hausa followed hot on its heels, becoming a nightmare for the Igbo people in Nigeria. On the back of a massacre that would continue throughout the war, the southeastern provinces of Nigeria declared themselves the Republic of Biafra and attempted to secede from the rest of the country. Although atrocities occurred on both sides, the use of starvation as a weapon to the isolated and war torn Biafra has become one of the grim trademarks of that vicious war. A number of books have been popping up recently describing life and war in Africa, from a variety of cultures and perspectives. Chimamanda Ngozi Adichie’s novel is one among many; however, it is one that stands out. The author is a gifted storyteller and her novel drew me in from the very first page and did not let go until long after I breathed in the last word. I am struggling with what to write about this book. The story moved me beyond words. I found myself chuckling during the lighter moments of the book, bubbling with anger at the atrocities described, fearful for the lives of characters I had grown to care very much for, and as if covered by a great veil of sadness, knowing that although Adichie’s novel is a work of fiction, there is much truth there as well. The author’s words breathe life into the characters. How typical Ugwa was as a thirteen-year-old boy! There was Olanna with her kind heart and self-doubt; Odenigbo, so full of passion for what he believes; Richard whose outsider status never held him back from believing he belonged and yet whose uncertainty made him unsteady on his feet; and Kainene, who stood apart and kept her distance more often than not, hiding behind her sarcastic comments. It was Kainene I was most fascinated by, surprising even myself. I would have expected to be taken in more by Olanna’s gentle but tough character for she is the character I could most identify with. Adichie painted a vivid picture of the brutality of war and the impact it had on her characters. No one went unaffected in some way, whether they paid the ultimate price or were oblivious throughout most of the war. I especially remember the scene near the end when a woman visits the Nsukka home searching out her old friend, Odenigbo. She makes a comment about how life had gone on for her almost like normal during the war and that she had no idea the extent of the war on her Igbo friends. She only learned of the terrible conditions her Igbo friends endured by reading a London paper while attending a conference. The irony, the dichotomy, of the situation was like a hammer hitting a nail home. From the interactions of the characters and their relationships, and in the war itself, the author was able to touch up the issues of race and class struggles, the prejudices surrounding them. One aspect I found intriguing throughout the novel was the underlying influence the British colonization had on the various tribes and cultures in Nigeria and how much of that played into the events that would unfold in that country as well as in the book itself. It came as no surprise, mind you; however, it is a reminder of how all actions have consequences, some of which are unforeseen until they completely unravel. The morning after, I still feel the affects of this marvelous book. 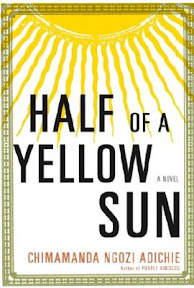 Half of a Yellow Sun is a haunting story that took me right into the hearts of the characters and a country torn by jealousy, greed and hate. The story of Nigeria’s Civil War is not so unusual in the grand scheme of things, but it is a story that needs to be told and remembered. Still, Half of a Yellow Sun is not just about the war, it is about the people, their relationships, and their struggle to survive. Favorite Part: With a novel like this, it is hard to pick out one favorite part, or even two or three. There was not a moment while reading this book I was not riveted to the words on the page. The characters were well drawn and interesting and the story flowed so smoothly that I was surprised at how quickly I moved through the book. I liked how the author divided up her sections, at times going back and forth in time. The break from the war to return to the pre-war period was a short reprieve from the darker moments in the story, while at the same time proved quite revealing in better defining the characters and their relationships with one another. Miscellaneous: There is a section on the author's website where people are allowed to share their own experiences regarding Biafra, which I spent a little time perusing and hope to revisit again to read at more length in the future. I was most intrigued by the houseboy and how the war affected his life. I also thought it was interesting how much more attached he seemed to the people he worked for than his actual blood relatives. I am so glad you enjoyed it - It is one of my top books this year. Yes! I loved this book too. Have you seen a pic of her? She is beautiful. I want to read Purple Hibiscus soon! I'm glad you really like it! It was the first book I blogged about, I think. I love Adichie, her style is so compelling. Read Purple Hibiscus, you won't regret it. Kookie - Ugwa was an interesting character. I noticed that too, about his being less attached to his family. I wonder if that was a cultural thing and had anything to do with his duties to his master? I don't know enough about that aspect of the hierachy to know for sure. I do know that the author did not delve too deeply into the thought processes of her characters on purpose--she mentioned that in an interview that is posted on her website. Joy - I completely understand. 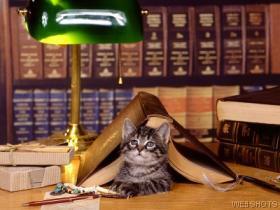 :-) I do hope you enjoy the novel when you have more time to get back to it! Sally - I can see why so many people enjoyed this one. It's quite powerful. Sheri - I need to get a copy of Purple Hibiscus. I am definitely interested in reading that one now. Siew - I was quite impressed with the novel and how easily it flowed. I will for sure be reading Purple Hibiscus one of these days. Thanks for the recommendation. You've written a beautiful review of this most intriguing book. As in the case of joy, I'm not feeling in the mood for this right now, but it really must be on my must-list. Thank you. Thank you, Tara. I think this is a book that a reader needs to be in the mood for before reading. I hope you will enjoy it.